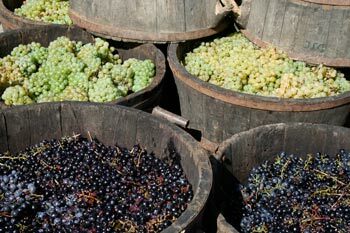 ...that we picked enough to make almost 1000 litres of wine. 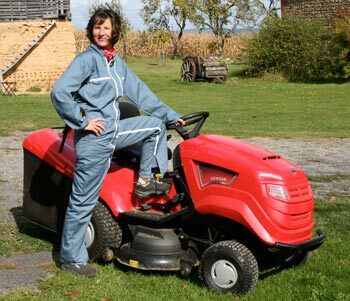 Tractor girl comes to the rescue in her new "bleu de travail". and raided our fig trees. 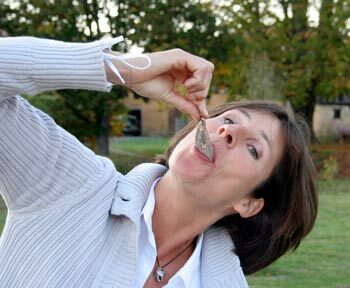 But they did bring fresh herring for Caroline. Her favourite! 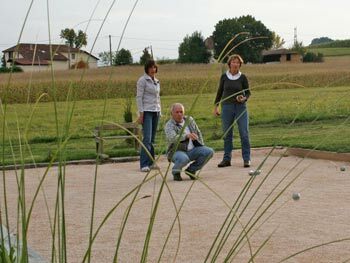 The evenings were still balmy enough for a few games of boule. 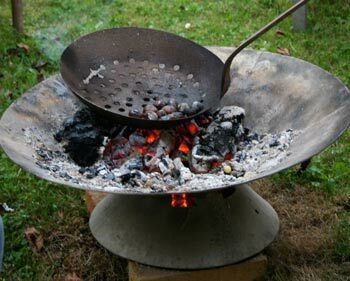 ...with an old roasting pan we found in the barn. ...and on with the original, old wooden wheels. 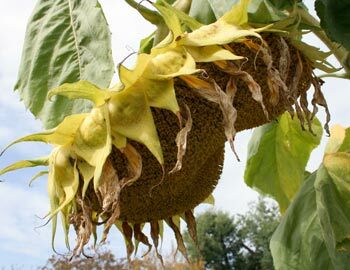 The enormous heads on the sunflowers will give thousands of seeds for the bird table in the winter, as well as for sowing next year. in front of our house. 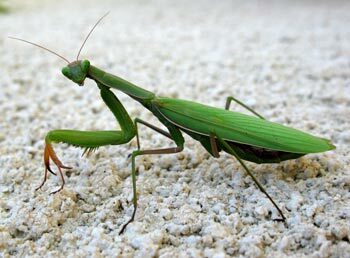 What a fantastic creature. Caroline went to Holland for a week and ate all the things she can't get here. 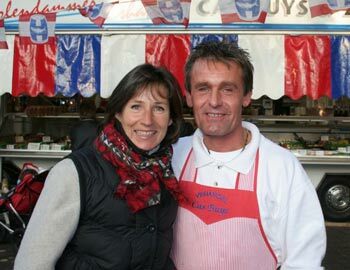 Here she is, getting her herring fix, from Cas Buys, the fishmonger in Abcoude, her home town. With the shadows getting longer and the landscape turning to gold, autumn is a beautiful time in the country. Apples are being plucked and stored, vegetable plots cleared and prepared for winter and the sunflowers harvested of their blackened, seed-filled heads. The maize will have to wait another month, but the vines are laden, ripe and ready to pick. 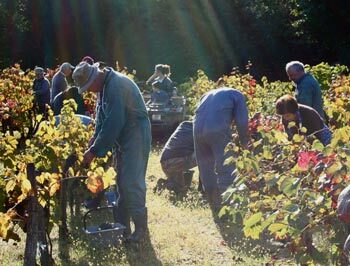 At the beginning of October we were invited to join our neighbours Alain and Marie Christine Deffis and their extended family, in the annual vendange. 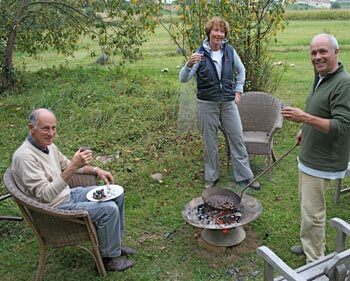 Four generations moved through the ranks of vines, chatting away, catching up on gossip and generally having a good time. The sun came too, after several days of rain, as if Bacchus, the god of wine, was warmly approving of us continuing an age-old tradition. Being the only non-family, non-French people there, we felt honoured to be invited again and cherished every moment. 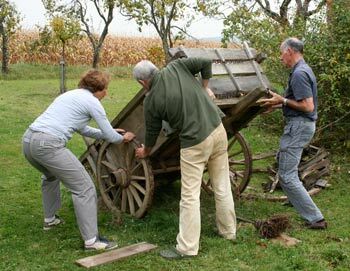 Once the last barrel was placed on the cart, we adjourned under the trees for apèros and to pick at an impromptu buffet table of pasta, paté, salad, chicken, cheese and some of last year's wine. After such a treat, it took some effort to get back into the cars and go pick grapes at two other, smaller family vineyards. The end of the afternoon, saw the last of the grapes tumble into the huge 1100 litre barrel and we then sat around a huge table for a last glass of sparkling wine and an excellent, homemade vanilla ice cake. Backs and fingers aching, but our hearts and stomachs happy, we slept well that night. Perry has been following the local rugby club for a while and was invited to become a dirigeant. This a glorified word for one of the twenty or so members who man the bar, cook and server the players' dinners and generally run around organising activities around match days and other social events. He accepted and is now part of a team of seven that are 'on duty' once every three weeks. It is a good excuse to get together with some the usual suspects (Alain, Serge, Jeff, Daniel and Jeanie) and integrate in the local social scene. Around the same time, the Puydarrieux Comité des Fêtes had a recruitment evening. The existing 12 members were mostly the younger generation, studying and living away from home. Only back for weekends, it made it hard for them to get things organised in time. The evening went well as ten more Puydarrians, including Perry, joined the comité. His first engagement being the fête of Puydarrieux, in September. Caroline would have joined, but finds the endless meetings around the table are absolutely not her cup of tea, having already sat at enough management meetings in her life! Not that she is aversed to giving a hand where needed on the day. It started with a Skype conversation with Caroline's parents one evening. 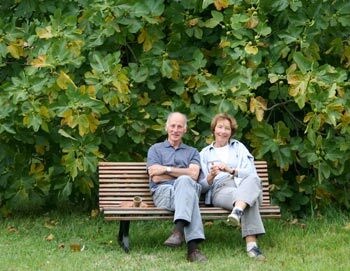 When Peter heard that the fig tree was groaning from the weight of its fruit, Caroline jokingly said, "...why not grab a cheap weekend return?" Her dad being someone who prefers to plan ahead, a spur-of-the-moment trip was not likely. But half an hour later the phone went. "We're arriving on Saturday and leaving Tuesday. If that's alright Perry." With two days' notice, we cleared the decks and house and Caroline went to pick them up from Pau. The weather was kind and they stripped the tree of its sweet crop and made pots of jam. Not having the car, they brought just a few goodies from Holland, including fresh haring from the local fishmonger in Abcoude, which is Caroline's favourite and most-missed treat. 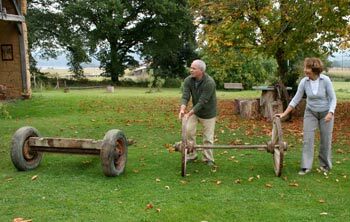 The days went by quickly, but we managed to get in a couple of games of boules, roast chestnuts, saw up a pile of logs and even replace the tyred wheels on the old cart with some original wooden wheels we found in the barn. I knew that Peter wouldn't be able to stay here and not roll his sleeves up. Good on you! Caroline felt it was time to visit her little niece and nephew, Inez and Tom. Having grown up in our absence, they only have a few photos and a voice at the end of the phone to work with. 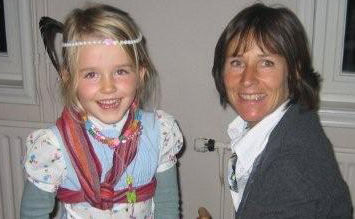 Transavia offered a deal and she took it, just in time for the half term holidays. Her whistle-stop visit involved catching up with a few friends in Amsterdam, an evening dancing salsa with her brother Jeroen and a tea stop at uncle Frank and aunt Mirjam in Hilversum. On to Olst in the east of the country for three days of quality time with her other brother Diederick, his wife Lilian and their two kids. Perry had the place to himself, but was never lonely. Invitations coming from all sides for lunch, dinner, rugby and golf, he was hardly home. Perry's old mate Malcolm and his wife Linda came over for a couple of weeks. They now have a house just ten minutes up the road. Perry had a gloriously sunny round of golf with Mally at the beginning of their stay and then it suddenly went cold and very wet. Linda had to go back after a week, so it was a great excuse for Perry to pop over and watch the footy at Malcolm's and chew the fat. 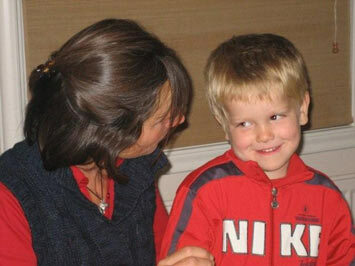 Giggling at nothing like the couple of naughty schoolboys that they always will be. The other visitors came in overhead, in a long V formation. The occasional call as they circled towards the lake at Puydarrieux. Grey cranes began to spend the winter here a few years after the lake was created. There are now approximately 600 who roost there each evening, instead of flying on beyond the Pyrenees to Spain. They always arrive in the same week that the last swallows pass over, heading south. Do you have a web site suitable for us to make a reciprocal link? © 2009 Perry Taylor and La Baguette Magique, France.